The Ultimate Reference & Learning Guide for SAP MM/PP Consultants SAP PP Interview Questions, Answers, and Explanations! It’s clear that Production Planning is a key specialization for SAP MM resources — and finding answers can be difficult. 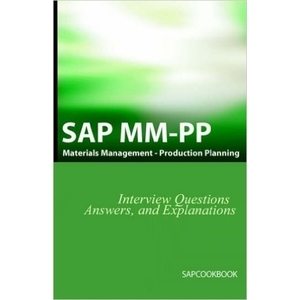 SAP PP Interview Questions, Answers, and Explanations guides you through your learning process. From helping you to assess your SAP MM/PP skills to evaluating candidates for a job, SAP PP Interview Questions & Answers will help you understand what you really need to know. The book is organized around several areas of SAP PP: Demand Management, BOMs, Order Release and Confirmation Each question includes everything you need to know to master the interview or properly evaluate a candidate. More than just a rehash of SAP documentation and sales presentations, each question is based on project knowledge and experience gained on successful high-profile SAP PP implementations. Jim Stewart is Professor in Leadership and HRM and Director of the Human Resource Development and Leadership Unit at Leeds Metropolitan University.